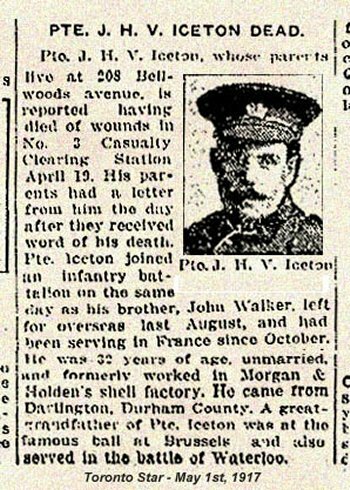 Brother to Private John Walker Iceton, reg. no. 769481 who survived the war. Source: Private Memories: The Iceton Brothers, compiled and edited by Vanessa Dal Bello. Wounded at Vimy Ridge during the attack. Pte. J.H.V. Iceton, whose parents live at 208 Bellwoods avenue, is reported having died of wounds in not 3  Casualty Clearing Station April 19. His parents had a letter from him the day after they received word of his death. Pte. Iceton joined an infantry battalion on the same day as is brother, John Walker, left for overseas last August, and had been serving in France since October. He was 32  years of age, unmarried, and formally worked in Morgan and Holden’s shell factory. He came from Darlington, Durham County. A great-grandfather of Pte. Iceton was at the famous ball at Brussels and also served at Waterloo. Source: Toronto Star – May 1st, 1917 via CVWM. 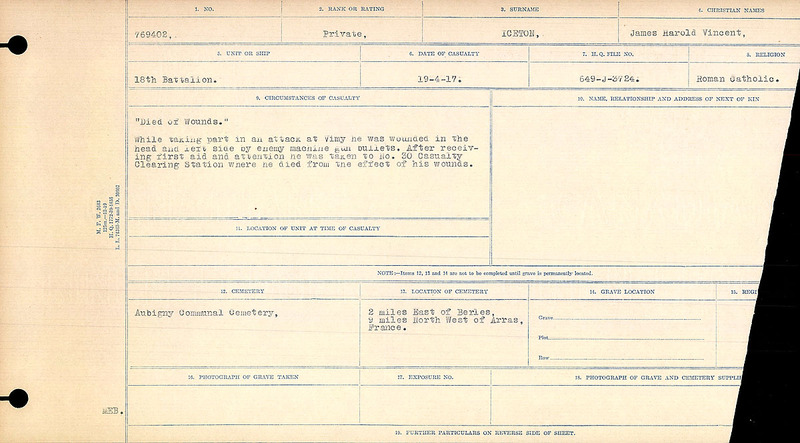 “Died of Wounds” While taking part of the attack at Vimy he was wounded in the head and left side by enemy machine gun bullets. After receiving first aid and attention he was taken to no. 30 Casualty Clearing Station where he died from the effect of his wounds.